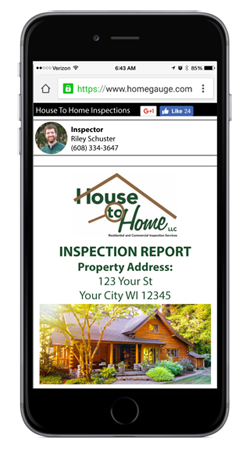 At House to Home, LLC, owned and operated by Wisconsin home inspector Riley Schuster, we go the extra mile during our home inspections because it’s what our clients deserve. We work for you and nobody else, so you can count on the information you receive in your inspection report to be unbiased and comprehensive. Unlike those who rush from one job to the next, House to Home takes our time at every property to uncover the things that are otherwise easy to miss. We deliver information in a straightforward way that will help you understand the property’s condition, its repair and maintenance needs, and its operation. With years of construction experience under his belt, our inspector has an understanding of home systems and components that goes well beyond what is expected of a licensed home inspector. We want to use what we know to benefit our clients and help them make the best decisions possible about their investment in their future home. Please join us on the day of your inspection. We would love to take our time helping you become more familiar with the property, and we encourage you to ask any questions that you may have. Enjoy the peace of mind that comes from having a trustworthy and experienced home inspector in your corner! The login for your home inspection report will be delivered directly to your email within 24 hours of your inspection. Your digital report will contain expandable photos, detailed information about each inspected component, and video where necessary. We generate these reports using HomeGauge Software, and they contain an interactive tool called the Create Request List™ (CRL)™ that makes it easy and hassle-free to request repairs. Using the report itself, you and your real estate agent will be able to build a project list right in the CRL™ that can be shared with the seller. Give us a call any time after receiving your report with your questions! Contact House to Home Today! Schedule home inspection services in the Greater Madison Area. Call us to ask about discounts for law enforcement, first responders, veterans, educators, and repeat customers.